Prior to the spread of lift served skiing throughout the region, Mt. Sterling was home to the Jug End Trail, which dropped some 1,000 vertical feet to the slopes near Jug End Barn. 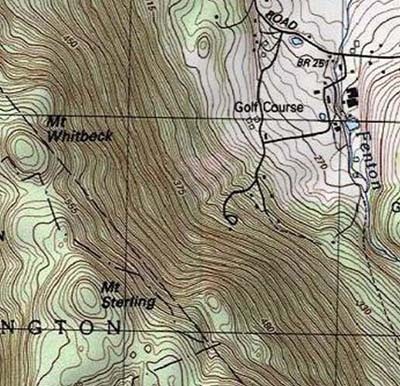 During the late 1950s and early 1960s, Jug End developed full service ski area on the lower slopes of Sterling Mountain. While a T-Bar climbed 350 vertical feet, much of the mountain lacked lifts and skiers. In the early 1960s, Bousquet, Butternut Basin, Catamount all installed chairlifts, making the Jug End T-Bar seem like a dinosaur in comparison. For the 1963-64 season, a new 500 vertical foot trail was advertised, some 150 feet larger than the existing ski area. At the time, lift service for this new trail was projected to be via helicopter, snowcat, or a new T-Bar. 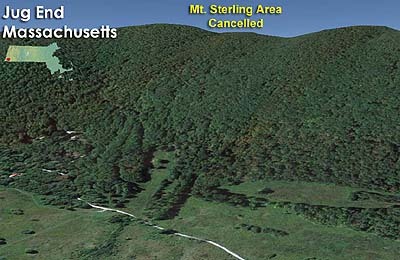 Also at this time, Jug End announced it would start clearing trails to the summit of Mt. Sterling. The trails were projected to be about 8/10 of a mile long with a vertical drop of around 1,000 feet. A new double chairlift was suggested as lift service for the new area. The expansion would have instantly made Jug End one of the largest ski areas in Southern New England. The new lifts would never be installed. Instead, Jug End continued as a T-Bar served ski area until it closed around the start of the 1980s.